Lebanon doesn’t have different religions. It has only one. Money. If you want to know why civil marriage is still unavailable in this country, don’t look into holly books. Look into accountancy books. See how much revenue religious marriage generates. Then you’ll understand why religious institutions are so passionately against it. And why they’ll do anything to stop it from happening. What about politicians? They talk a lot about it, many claim to be in favor of it, but strangely, they don’t do much to make it happen. Why? In a constitutionally sectarian country like ours, what defines politicians is the religion and sect they belong to. Here, there are no left and right wings, no republicans and democrats, no labour and conservatives. Here, there are christians and muslims. There are maronites, orthodox, sunnis, shia, druze... It’s only in that sectarian quality that politicians can hold office. No wonder none of them dares to challenge the religious marriage business and upset the powerful institutions that profit from it. 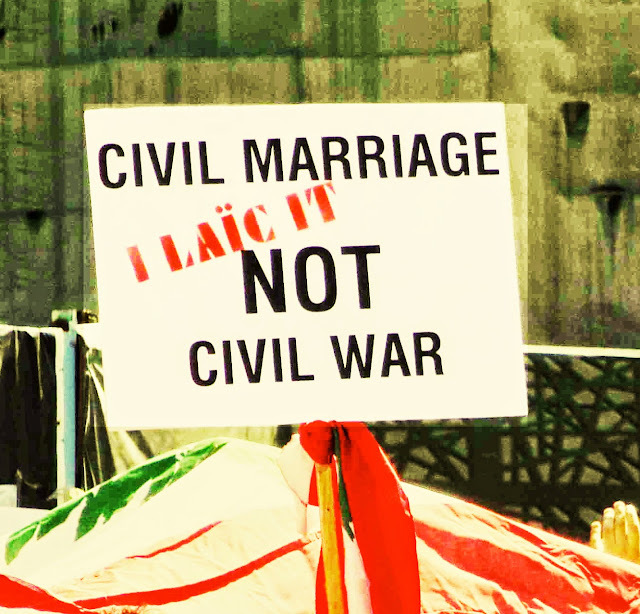 Is civil marriage doomed? Not so sure. When people are forced to give their money to an individual or to an organization, it’s called extortion. Not allowing us to choose between civil and religious marriage is effectively forcing us to give our money to the sole religious institution representing the sect we were born into. In general terms this is called a monopoly. But in Lebanon, marriage can't be considered as any other commercial service one can choose to use or not. In lebanese society, marriage is a crucial, if not a vital part of a man and a women's life. The only choice left for lebanese to have a civil marriage is to travel abroad. Something the overwhelming majority can't afford. Therefore that monopoly could be morally argued to be a type of extortion. If proven to be so, it would be very difficult for religious institutions and politicians to defend it or simply ignore it. Especially that the main argument used to justify religious marriage's exclusivity is based on higher moral principles! One might say that this not the first hypocrisy plaguing our Republic, nor it is the last. But then again, what are public opinion and civil society for? This may yet be the key to civil marriage in Lebanon. And it's well worth a try, isn't it?